After I left CFNY (as programmer), I went to Maclean Hunter's KEY 590 and suffered through playing oldies part time until the company bought CFNY and Reiner Schwarz asked me to come back to do afternoon drive, where I paired up with Jim Duff (The Duffer) for a couple of years until the company decided it was time to position the station more in the mold of North America's "Modern Rock" outlets. At the time they let me go, I had begun getting involved with Toronto's rave scene and absolutely fell in love with techno music (I was actually successful in getting CFNY to play some of the early techno stuff like "James Brown Is Dead" and "O Fortuna."). I had a fairly good voice over career going as well (that's the time that I worked for YTV), so radio ceased to be a priority for me until 1992 when I became "Dr. Trance" and began an alternative dance program on Energy 108 that actually became quite successful, considering it was a specialty show with what I believed to be limited appeal. During the next few years I did fill in work on Energy and Q-107 (!) and then moved full time to HOT 103.5. 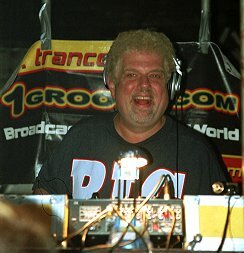 Last year I went to Newmarket's Power 88.5 (as of last month I am no longer there) and started The Global Groove Network on CHIN-FM (all night progressive dance 7 nights a week) as well as returned The Dr. Trance Radio Programme to what I believe is the next level of creative media--the internet. Dani Elwell had told me about Virtually Canadian, where she and Hedley Jones (Deadly Hedley) had programs running, and I joined the staff (unfortunately, the site has a myriad of financial problems right now and is only sporadically running. Dani is also no longer there; I'm not sure about Ivar Hamilton, who was also doing a show there, as was David Marsden(!) from Vancouver). I am currently back into the voice-over marketplace, where I am the male staff announcer for TSN, as well as programming The Global Groove Network (100.7) and doing a show called "Technopolis" all night Friday. Of the dozens of radio stations I've worked for, CFNY is one of two that I can point to with pride. I always believed the true alternative format could be financially and esthetically successful given the right combination of people. And we were for a while. But not enough for the big companies that gobble stations up as investment potentials rather than for any reasons that could be remotely connected to the art of the medium. The Edge has become successful by readjusting its focus and narrowcasting to an audience tired of hearing Led Zepplin and Jimi Hendrix all day; they have in fact become the new Q107. I'd always believed that there would someday be a new alternative on the dial, but with the relaxation of ownership rules by the totally out-of-touch CRTC, I now believe that my once hope is now just a dream. In the meantime, I'm lucky to have found another way to express the joy of playing music nobody has ever heard of to an appreciative audience via The Global Groove Network, but with today's state of radio, I keep waiting for the other show to drop. Well, I suppose it's time for another update, since everything has changed since I last wrote to you (which seems a lot longer than 2 years). First off, David Marsden, James Ufton, Kevin O'Leary, Hedley Jones and I are long gone from Iceberg Media. I think Bob Lehman is the only one from The Spirit still there, but I'll bet anything he'll leave soon to join his wife's extremely successful business (making pet food!). FYI-David is now the program director of FLOW 93.5fm and James Ufton is a computer consultant. Hedley and I both do programs for DJ Shows.com (www.djshows.com), and that's as close to radio (or what passes for radio) as I wish to get at this time, although I am doing voice overs for FLOW (hey-I had to audition!) as well as ESPN Classic Canada and The NHL Network (TSN went through an image overhaul about a year ago, but CTV decided they wanted to keep my voice in the family somewhere). My web show is still called "Technopolis", and can be heard live Thursdays from 6-8pm or any time via the archives. Feb 2010: Don, among many other things, can be heard as the voice of the documentary series, Cold Blood, on History Television. December 2014: Don is doing quite a few stage productions on a regular basis in the Toronto area. Don can also now be heard on David Marsden's newest enterprise: NYTheSpirit.com . Featuring a bedrock of music featured on the old CFNY, it has several CFNY personalities with their own shows: Don Berns, Ivar Hamilton and Rob Stuart of Slave to the Squarewave fame. David himself does a live-to-air show on the site every Saturday and Sunday night. Don passed away unexpectedly on March 1st, 2015. He was a tremendous talent and friend, a big voice with a bigger heart. He will be missed.